Tr = treble: yarn over twice, insert hook into the indicated stitch, yarn over and draw through indicated stitch only; yarn over again and draw through the first two loops only; yarn over again and draw through the next 2 loops only; yarn over and draw through the last 2 loops on the hook. 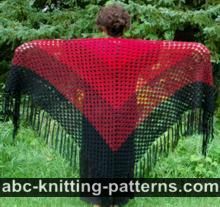 The shawl is worked starting from the bottom point up to the top edge and can be made smaller or larger by changing the number of rows worked, as long as the total number of rows is a multiple of 15 (e.g 120, 135, 150, 165, etc). 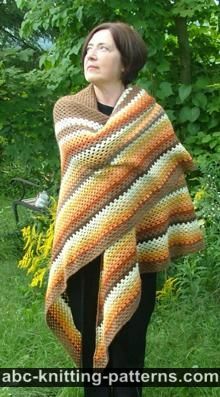 In my shawl, the number of rows is 135. Row 1: tr 6 in the first chain. Turn. Row 2-3: ch 2 (counts as 1 sc), 1 sc in each of the next 6 tr. Turn. Row 4: ch 4 (counts as 1 tr), tr 6 in the first sc, skip the next 5 sc, tr 7 in the last sc. Turn. Rows 5-6: ch 2 (counts as 1 sc), sc in each stitch across. = 14 sts. Turn. Row 7: ch 4 (counts as 1 tr), tr 6 in the first sc, (skip 6 sc, tr 7 in the next sc) twice. Turn. Rows 8-9: ch 2 (counts as 1 sc), sc in each stitch across. = 21 sts. Turn. Rows 10: ch 4 (counts as 1 tr), *tr 6 in the first sc, *skip 6 sc, tr 7 in the next sc – repeat from * to the end of the row. Turn. Rows 11-12: ch 2 (counts as 1 sc), sc in each sts to the end of the row. Turn. Repeat rows 10-12 x 131 more times, or to desired length. As I noted, the total number of rows should be a multiple of 15. 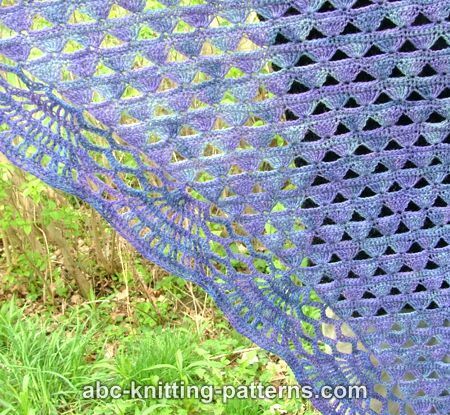 As described, the shawl will have 135 total rows. With RS facing, tie yarn to one of the top corners of the shawl. The border is worked from one top corner, around the bottom point, then along the other edge to the other top corner, back and forth. Row 1: ch 3 (counts as 1 dc), dc in the next sc row, *ch 7, skip “fan” row (row with 7 tr), dc between the 2 sc rows – repeat along the edge to the first “fan” row (first row of the shawl), ch 7, sc in the tip (the very first chain), ch 7, dc in the sc row, *ch 7, dc between 2 sc rows – repeat from * along the edge, 1 dc in the last sc row. Turn. Row 2 and all even rows: ch 2 (counts as 1 sc), 1 sc in each stitch of row 1. Turn. Row 3: ch 4 (counts as 1 tr), tr in the next sc, * 1 tr in each of the next 7 sc, skip the next 4 sc, sc in the next sc, (ch 7, skip 7 sc, sc in the next sc) 3 times, skip the next 4 sc – repeat from * along the edge to the tip of the shawl: ch 3, 1 tr in each of the next 7 sc on the tip of the shawl, ch 3, sc in the next sc, *(ch 7, skip the next 7 sc, sc in the next sc) 3 times, skip 4 sc, 1 tr in each of the next 7 sc – repeat from * along the edge up to the top of the shawl, 1 tr in each of the last 2 sc. Turn. Row 5: ch 4 (counts as 1 tr), 1 tr in the next sc, * (tr 1 in the next sc, ch 1) 6 times, tr 1 in the next sc, skip 4 sc, sc in the next sc, (ch 7, skip 7 sc, 1 sc in the next sc) 2 times, skip the next 4 sc – repeat from * to the tip of the shawl: ch 7, skip 7 sc, (tr 1in the next sc, ch 1) 6 times, tr 1, ch 7, skip 7 sc, sc in the next sc, * (ch 7, skip 7 sc, sc in the next sc) twice, skip 4 sc, (tr 1 in the next sc, ch 1) 6 times, tr 1 in the next sc, skip 4 sc, sc in the next sc – repeat from * to the last 2 sc, tr 1 in the each of the last 2 sc. Turn. Row 7: ch 4 (counts as 1 tr), 1 tr in the next sc, * 1 tr in the next 13 sc, skip the next 4 sc, sc in the next sc, ch 7, skip 7 sc, sc in the next sc, skip 4 sc – repeat from * to the tip of the shawl; 1 tr in each of the next 27 sc of the tip; *skip the next 4 sc, sc in the next sc, ch 7, skip 7 sc, sc in the next sc, skip 4 sc, 1 tr in each of the next 13 sc – repeat from * to the last 2 sc, 1 tr in each of the last 2 sc. Turn. Row 9: ch 4 (counts as 1 tr), 1 tr in the next sc, *(2tr in the next sc, ch 1, skip the next sc) 6 times, 2 tr in the next sc, ch 1, skip 4 sc, sc in the next sc, ch 1, skip 4 sc – repeat from * to the tip of the shawl: (2 tr in the next sc, ch 1, skip the next sc) 13 times, 2 tr in the next sc, * ch 1, skip 4 sc, 1 sc in the next sc, ch 1, skip 4 sc, (2 tr, ch 1, skip the next sc) 6 times, 2 tr in the next sc – repeat from * to the last 2 sc, 1 tr in each of the last 2 sc. Row 11: ch 3 (counts as 1 dc), 1 dc in each sc along the edge. August 09. 2016: Pattern was revised and updated. tr stands for treble crochet. Or triple crochet if that makes it easier to remember. I just downloaded this very interesting pattern and read your question. I think "tr" means triple crochet. That's what I going to do. Isn't this a beautiful idea? 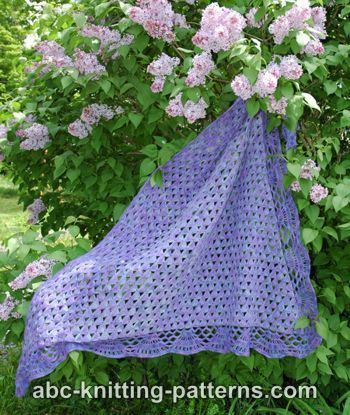 I hope someone already answered your question, and that you're already on your way to making this shawl. In case you still don't know, tr is the abbrevistion for the treble (or triple) crochet stitch. You can do an internet search for tr and get directed to many sites with photo & video tutorials. If this stitch seems unwieldy to you, try working double crochet stitches (dc) in place of each tr st (stitch). Best of luck to you! "tr: means trebble - where you yarn over 2 times.